Edge coloring is an amazing addition to a letterpress project. These are a couple thousand cards stacked up, just completed for GS Design in Milwaukee. 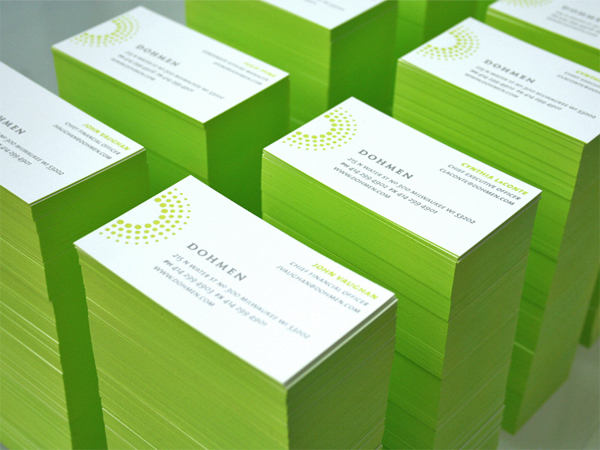 They designed these for their client Dohmen. 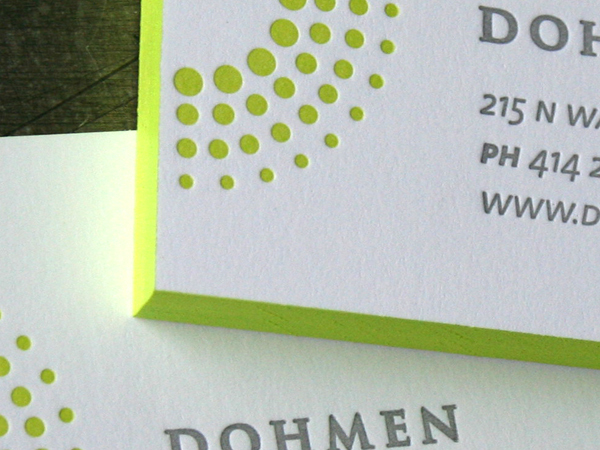 The radial dots are a nice contemporary design on the face of the card and the sides are a matching vibrant green. They are printed in two PMS colors on thick 165lb Neenah Solar White. We can match edges to any printed PMS color. And the effect looks at it's best on stock 160lb or thicker. It's taken us a few years of practice to get the edge coloring production process just right, so we are purposefully a bit elusive about exactly how we do this. It has something to do with unicorn tears and hens teeth. ;) The effect is much more subtle when seen as a single business card and always makes people take a closer look.